Halloween Garden Party Ideas For Spooktacular Fun! Halloween has become as popular here in the UK as it is in America. Trick or treating is something kids love to do, and what better way to entertain them afterwards than with a party in a spooky Halloween log cabin. Garden log cabins are much more than a shed. They are so much better than just a summer house and can be decorated to feel like an extension of your home. If you have a log cabin this could be the ideal space to create a spooky Halloween haven for your guests. It’s easy to make it part of your garden party and you can decorate it both inside and out. Get your kids involved in the preparations. They could make spooky paper ghosts and witches. Make some templates they can draw round and cut out. Decorate your outside space with spooky lights in the trees. You can buy outdoor fairy lights in different shapes such as pumpkins. Imagine how pretty and inviting your Halloween log cabin could look with the warm glow of pumpkin lights in the windows. Imagine a Halloween log cabin that will be the envy of your neighbours. Place signs outside your log cabin door to welcome your Halloween guests. Large cut out black cats, pumpkins, or ghosts can be a fun way to provide a welcoming entrance. Make ghosts by hanging white fabric over balloons. If you’re entertaining kids, here are a few fun games they’ll love to play. 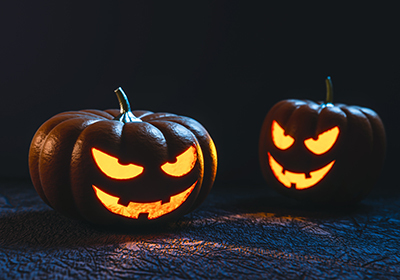 Create a spooky treasure hunt by hiding a few sweet treats in places such as under witch’s hats, inside pumpkins or buried near trees. You could even place clues on signs to make it more fun. Tell spooky stories. Kids of all age love scary stories, but make them age appropriate. Very young children are more easily scared! Get the children to sit round you in a circle to make it more cosy. Darken the cabin so you only have spooky lighting from pumpkins or fairy lights. You could either tell them a story yourself, read to them from a book, or get the kids to tell each other spooky stories. Making chocolate apples. Kids will love making their own pretty chocolate coated apples. All you need are apples, melted chocolate, lolly sticks, and hundreds and thousands. Have a competition to see who can make the best one and give a bag of spooky sweet treats as a prize. You’re never too old to enjoy Halloween, and holding a garden party for your friends can be great fun. If you have a log cabin in your garden you could make it the perfect place for entertaining on a mild autumn evening. As the evening gets later, imagine sitting around a TV with your friends inside your cosy log cabin. Dim the lighting and watch a scary film together. I wonder who will be the first one to dare venture outside afterwards! For great Halloween garden party ideas you’ll find lots of inspiration online to help create the perfect creepy garden! From making scary witches to baking ghoulish treats your guests will love. If you have a barbecue area decorate it with coloured lanterns to give an eerily spooky effect. Cover the table with a creepy halloween tablecloth and ghoulish decorations. Great for scaring the guests! Make delicious and warming pumpkin soup and serve with slices of garlic bread cut into shapes of fingers. Dip them into tomato ketchup to make them look gruesome! Make a Halloween punch for the kids by mixing lemonade, cranberry and orange juice together in a large bowl. Serve with witch’s finger sweets or other tasty ghoulish creations. Use your imagination and see what you can create. Create your perfect all year round entertaining and living space with a garden log cabin. Take a look at https://www.creativelivingcabins.co.uk for some inspiring ideas.